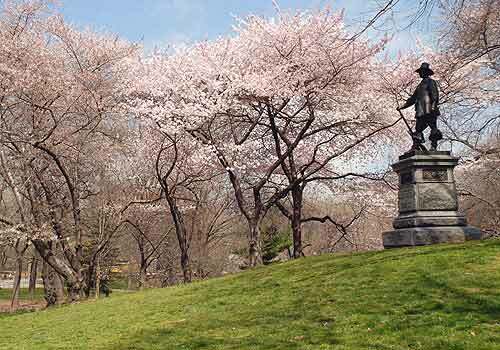 The knoll that rises to the southwest of Conservatory Water, is known as Pilgrim Hill because of the bronze statue of a Pilgrim that crowns its crest. Sculpted by John Quincy Adams Ward, The Pilgrim was gifted to Central Park by the New England Society in 1885. It as one of the best sledding spots in the Park; in the warmer months, it's a popular spot for picnicking and lounging. East Side at 72nd Street just south of Conservatory Water.